In this category, we offer you professional ski simulators. Two model series, Basic and Standard, can cover the operational needs of our customers, from beginners to professionals. A ski simulator can quite naturally simulate the motions of downhill skiing and so it’s possible to actively exercise all muscle areas necessary for maintaining a correct skiing position. Regular training on a ski simulator helps you to improve your both your physical fitness and skiing technique and positively affects the cardio-vascular system. A ski simulator is an excellent tool for both physical and technical preparation for the season. If you exercise regularly for relatively short periods of time, your body will gain muscle mass and you’ll improve your balance, rhythm and the precision of your curving. 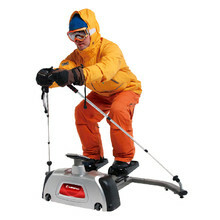 Exercising with a ski simulator strengthens your entire body and improves your skiing technique.